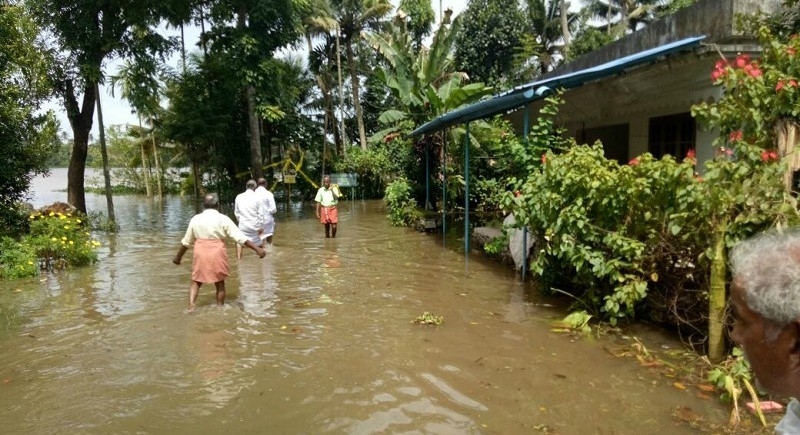 Thiruvananthapuram, August 10: With incessant rainfall brimming Kerala in a dangerous situation, rescue operations continue after flash floods and landslip triggered by the Southwest monsoon claimed 26 lives in Kerala. Rescue teams, including military and NDRF personnel examined through soil and rubble in an attempt to save victims of landslips and authorities, began evacuation of families as swollen rivers breached banks. Emergency services began efforts to restore the damaged road to a resort at Pallivasal following reports that a group of tourists, including foreigners, were trapped in the building. Anticipating a drastic rise in water level in the Periyar River with an increased release at the rate of 300 cumecs of water from Cheruthoni dam in Idukki reaching the Paravur region in the next four hours, evacuation of people from areas likely to be affected is in full swing. The administration has opened 42 camps in the region so far in which nearly 8,000 people from 1,850 families have been sheltered. In all, 64 camps have been opened in the Ernakulam region and 9,401 people have been provided shelter. According to state Power Minister M.M. Mani who hails from Idukki, so far three shutters of the Idukki dam has been opened till Friday. The Army is taking part in rescue-relief and damage control exercises in Idukki, Wayanad, Kozhikode and Malappuram districts.